The Brooklyn Greenway Initiative, a citizen-driven project that began with a handful of insane visionaries picking up trash and planting flowers beside a BQE off-ramp, is taking shape on Columbia Street. Notice the space for greenery between the sidewalk and the curb. Plans call for the park to connect Greenpoint to Red Hook. I’m concerned that chunks of this aren’t going to get built, though… at least up here in Greenpoint and Williamsburg, waterfront open space construction is tied to redevelopment (that is, zoning requirements demand that developers include public space in all waterfront buildings) — is this the case in Red Hook, too? I’m worried that if construction $ dry up, we’re going to end up with a path to nowhere. Zach- BGI held a forum this past May where it was discussed that the waterfront rezoning doesn’t require a big enough esplanade for a bike path, so it would probably go on Kent and West Sts. 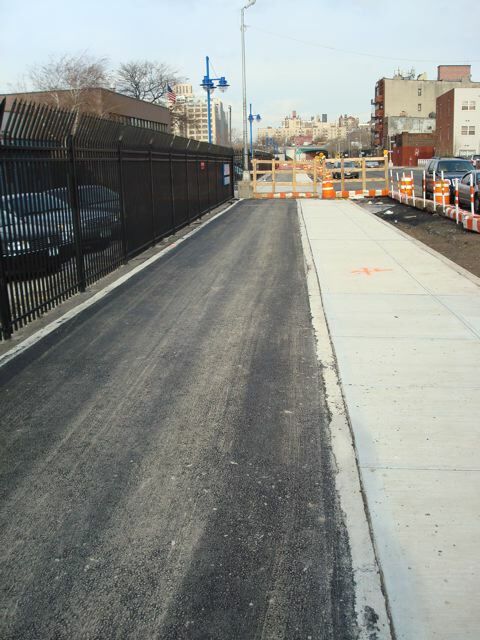 We need to pressure DOT to expand the kind of path they did on 9th ave to a two-way path on Kent and West. Awesome. But, while I LOVE the West Side Manhattan bike lane, it’s too narrow! When there’s a lot of people it can be hard to safely pass slower riders. 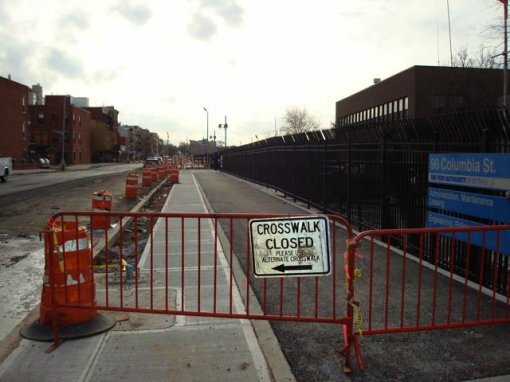 Unfortunately the Brooklyn greenway looks even worse. The city should create great big biking viaducts, biking avenues, like spokes out into Brooklyn and Queens and connecting to the East River bridges. Make biking a viable commuter option, to absorb some of the congestion-pricing former-drivers (who will bounce right out of the already overcrowded subways)! Things are not looking good for cycling on Kent Ave. Kent Ave roadway was rebuilt alongside the Navy Yard this year, and the curb lane width is narrower. This was done to slightly widen the sidewalk and center median. The sidewalk widening appears to be done to further the Greenway plans, but the resulting surface will still be far too narrow for significant two way cycling and walkers. The median did not have to widened at all. Result, the roadway will be less safe for cycling, the sidewalk not adequate for much cycling, so this project is actually making this corridor worse, not better. Further north up Kent, I am fairly sure that all requests to control motor traffic and provide safe space for cycling on the roadway will be dismissed as irrelevant and not needed because of the wonderful greenway that will be built – sometime. As noted, the greenway will be nice, but not wonderful, and “sometime” is a long way off. This is one gift horse we should be looking at very, very closely.